Draft: 2014, Houston Astros, 16th rd. Ramón Laureano was originally signed by Astros scout Jim Stevenson…was born in the Dominican Republic but graduated from Upper Rim Christian HS in Dix Hills, NY, in 2012…attended Northeastern Oklahoma A&M for two years (2013-14)…was selected to the Men's Division 1 all Region 2 team in 2014 after hitting a team-leading .439 with 19 doubles, 13 home runs, 69 RBI and 22 stolen bases...posted a .500 OBP, while recording more walks (21) than strikeouts (18). Spent the first four months of the season with Triple-A Nashville where he batted .297 with a career-high 14 home runs and 35 RBI in 64 games…was recalled by Oakland Aug. 3 and hit .288 with five home runs and 19 RBI in 48 games with the A's in his Major League debut…started 42 of the A's 52 games in center field following his promotion…had nine outfield assists, which led ML rookies and tied for second in Oakland history by a rookie (11, Mitchell Page in 1977)…they tied for fifth among all American League outfielders…had just 47 games in the outfield and his assists were second most in Athletics history by an outfielder with fewer than 50 games played to Wally Schang, who had 12 in 41 games for the 1915 Philadelphia A's…they matched the most by an ML outfielder with fewer than 50 games over the last 95 years (sixth time, last by Alex Escobar with Cleveland in 42 games in 2004)…all 47 of his defensive appearances came in center field, including 42 starts…was 7-for-8 (87.5%) in stolen base attempts and tied for sixth among AL rookies in steals…did not ground into a double play and his 156 at bats were fourth most in Oakland history among players with no GIDP…they were the most since Jason McDonald had 236 in 1997…hit .297 (33-for-111) with all five of his home runs against right-handed pitchers, .267 (12-for-45) against left-handers…had a .324 batting average with runners in scoring position…batted .322 with four of his five home runs and 16 of his 19 RBI in 28 games at home compared to .246 in 20 games on the road…hit .353 with a .455 on-base percentage and .676 slugging percentage when leading off an inning…batted .309 with all five of his home runs at night…hit .346 over innings 1-6, .173 from the seventh inning on…batted .353 against AL Central teams…slugged four of his five home runs against Texas…struck out in his only pinch hitting appearance…started games at every spot in the order except third and fourth…had his most starts in the eight spot (13) and hit .356 in 16 games overall batting eighth. his 12th game … the only player in Oakland history with a two-homer game earlier in his career is Mitchell Page who did it in his sixth game in 1977…is the fourth player in Oakland history to hit his first Major League home run off a pitcher with at least 200 career wins (last: Kurt Abbott off Jack Morris on Sept. 9, 1993)…is 21 years and 52 days younger than Colon…was three months shy of his third birthday when Colon made his ML debut on April 4, 1997…also had a career-high five RBI on the 20th against the Rangers…batted .317 in 23 games in August…collected his second career two-homer game Sept. 7 against Texas…it came in his 29th game and he is the first player in Athletics history with two-multi homer games in his first 29 games…the previous earliest was Jose Canseco, who did it in his 42nd game on April 21, 1986…his first home run that day led off the game, which was the first leadoff home run of his career…matched his season high with three hits on Sept. 12 at Baltimore and then had two assists the next night against the Orioles… had a career-high seven-game hitting streak from Sept. 19 to 25 (11-for-28, .393)…was the A's starting center fielder in the Wild Card game Oct. 3 at New York and went 0-for-3 with a walk. lone two-steal game July 20 against Oklahoma City…stole the 100th base of his minor league career July 30 at Salt Lake…hit .373 with eight home runs and 18 RBI in 28 games in July…walked 13 times and was hit by a pitch four times for a .450 on-base percentage…slugged .673 and had a 1.122 OPS…led the PCL in runs in July (24), tied for the lead in hits (41), ranked second in home runs and slugging, tied for second in extra base hits (16) and fourth in OPS. Spent his final season in the Houston organization at Double-A Corpus Christi where he batted .227 with 11 home runs and 55 RBI in a career-high 123 games…the batting average was the lowest of his three full seasons as was his .369 slugging percentage and .298 on-base percentage… also had a career-highs 463 at bats…tied for third in the Texas League in triples (6) and ranked fourth in stolen bases (24)…had the fifth lowest batting average among league qualifiers…led TL outfielders in games, assists (16) and double plays (6)…batted .295 (28-for-95) against lefthanded pitching compared to .209 (778-for-368) against right-handers…had an .891 OPS against lefties, .609 against righties…hit .193 with three home runs in 63 games in the first half, .262 with eight home runs in 60 games in the second half…had a .196 average with the bases empty, .268 with runners on…committed four errors in 123 games in the outfield for a .984 fielding percentage…appeared in 95 games in right field and 31 in center field…hit in every spot in the order except ninth…saw his most action hitting first (34) and second (29). CORPUS CHRISTI: Hit .095 over his first five games but then compiled a season-best 10-game hitting streak from April 11 to 22…went 12-for-43 (.279) with nine RBI during the streak…committed two errors over his first 15 games but followed that with a 74-game errorless streak from April 23 to July 23…drove in a season-high four runs April 28 against Frisco…finished April with a .205 batting average and then hit .188 in May…was successful in each of his 13 stolen base attempts from May 26 to Aug. 19…had his lone two-steal game of the season June 21 against San Antonio…batted .274 in July, which was his best single-month batting average of the season… was named Texas League Batter of the Week for the week of July 3 to 9…went 14-for-29 (.483) with five doubles, two triples, two home runs and five RBI during the week…collected an extra base hit in five consecutive games from July 5 to 9…was a perfect 5-for-5 with two doubles, a triple and three RBI July 9 against Arkansas …went 19 consecutive games without an RBI from July 23 to Aug. 17…then drove in 15 runs over his final 15 games…went 0-for-25 over an eight-game stretch from Aug. 8 to 17…that dropped his average to .204 but he went 22-for-57 (.386) over his final 15 games to finish the year at .227…had an RBI in eight consecutive games from Aug. 22 to 31 and batted .484 with five home runs and 12 RBI over that span…collected his lone two-homer game of the season Aug. 23 against Midland…went 4-for-5 Aug. 29 at Frisco. Had a breakout campaign while splitting his season between Double-A Corpus Christi and Single-A Lancaster…combined to hit .319 with 28 doubles, seven triples, 15 home runs, 73 RBI and a .955 OPS…named an Astros Organization All-Star by MiLB.com as a utility player…led all of minor league baseball with a .428 on-base percentage as he drew 70 walks in his 116 games… began the year with Lancaster, where he hit .317 with 19 doubles, 10 home runs, 60 RBI and 33 steals en route to being named a California League All-Star…named Lancaster's Player of the Month for July as he hit a blistering .460 with 12 extra-base hits (6 doubles, 2 triples, 4 homers), 15 RBI and a 1.350 OPS 17 games…also named the California League Player of the Week for the week of July 11-17…hit .652 (15-for-23) with six doubles, two triples, four home runs and 11 RBI in seven games that week…was promoted to Corpus Christi on July 21 and finished his season with the Hooks…played in 36 games in Corpus, hitting .323 with five home runs and 10 stolen bases…named Corpus Christi's Player of the Month for August after hitting .318 with 15 runs scored, four doubles, one triple, four homers, six steals and a .944 OPS in 24 games…following the season, was assigned to Glendale in the Arizona Fall League, where he hit .295 with four doubles, eight RBI, four steals and an .817 OPS…got off to a hot start in the AFL as he was named the first AFL Player of the Week for the 2016 season…hit .571 (8-for-14) with two triples, two doubles, three RBI, eight runs scored and three steals in four games that week. Played his entire season with Class A Quad Cities, where he hit .265 with 15 doubles, eight triples, four home runs and 34 RBI in 76 games. Drafted by Houston in the 16th round and signed on June 18…assigned to Rookie Level Greeneville and played in just 16 games in his professional debut…placed on the 60-day DL on July 25 and finished his campaign sidelined. 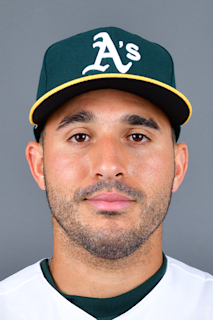 August 3, 2018 Oakland Athletics recalled RF Ramon Laureano from Nashville Sounds. May 21, 2018 Nashville Sounds activated RF Ramon Laureano from the 7-day disabled list. March 13, 2018 Oakland Athletics optioned OF Ramon Laureano to Nashville Sounds. November 20, 2017 Houston Astros traded OF Ramon Laureano to Oakland Athletics for RHP Brandon Bailey. January 13, 2017 Houston Astros invited non-roster OF Ramon Laureano to spring training. December 27, 2016 OF Ramon Laureano assigned to Tigres del Licey. August 1, 2016 Corpus Christi Hooks activated RF Ramon Laureano. July 29, 2016 RF Ramon Laureano roster status changed by Corpus Christi Hooks. July 21, 2016 RF Ramon Laureano assigned to Corpus Christi Hooks from Lancaster JetHawks. April 5, 2016 RF Ramon Laureano assigned to Lancaster JetHawks from Quad Cities River Bandits. March 6, 2016 OF Ramon Laureano assigned to Houston Astros. October 15, 2015 OF Ramon Laureano assigned to Tigres del Licey. May 29, 2015 RF Ramon Laureano assigned to Quad Cities River Bandits from Greeneville Astros. September 23, 2014 Greeneville Astros activated RF Ramon Laureano from the 60-day disabled list. July 25, 2014 Greeneville Astros placed RF Ramon Laureano on the 60-day disabled list. June 19, 2014 RF Ramon Laureano assigned to Greeneville Astros. June 18, 2014 Houston Astros signed OF Ramon Laureano.